As I mentioned earlier, our hotel lacked air conditioning too, so we slept atop the sheets. The temperatures barely cooled overnight, but it wouldn’t have helped anyway because we had to keep the windows closed against the street noise. We’ve had better nights of sleep. As with all the hotels we’ve encountered so far, our room had two twin beds, which Eleanor hates, but on this night I think we were better off being a few feet apart. The forecast was for more of the same on Tuesday and we didn’t relish the idea of another hot night, but fortunately I was able to cancel our second night without penalty. We got breakfast in the hotel’s elegant little restaurant (with views of the koi pond) and checked out. 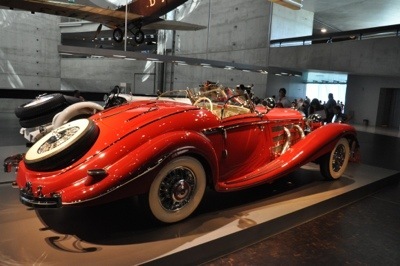 I mentioned in the previous blog that the only reason for us to go to Stuttgart was to visit the Mercedes Benz museum. I have lots of pictures from there and will post them on a Flickr album later. In short, it was excellent and exciting. We took about 2.5 hours to tour the museum’s 7 floors, descending in a spiral from level to level, and then caught the 11:45 tour of the adjacent Unterturkheim factory, where MB makes engines, transmissions, and forged parts. The tour’s main feature was a walk through the plant where they are currently making the OM651 4-cylinder Diesel engine and some M271 gas engines. The heat had struck again so at this point we were glad to get back to the car. The museum is air conditioned but the walking tour is definitely not, even inside the engine assembly building. We had a quick picnic lunch in the parking garage and then headed out to the Autobahn. 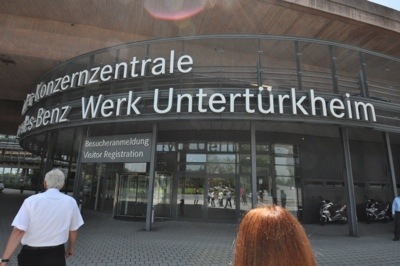 I’ve got the hang of the Autobahn now and I have to say it’s actually more tiring to drive than the US Interstates. Most of the time there are two lanes. The left one is too fast, filled with people who think they are Michael Schumacher zooming along at 150 kph+, while the right one is too slow, occupied by trucks that sometime creep along at about 80 kph. After the frequent slow-downs, the Citroen is rather casual about coming back up to speed (it is happiest about 120-30 kph, given some time to get there) so I had to change lanes frequently and it ended up being a lot more work than I would have expected. On the other hand, it was a very pretty drive down to Switzerland. Once we got free of Stuttgart the scenes were pastoral and seemingly endless. The border crossing was a non-event, since most of the Western European nations have abolished the need to show passports for EU and US citizens, and we were just waved through without a second glance. There wasn’t even a sign saying “Welcome to Switzerland,” and since the signs in that part of the country are all in German it was hard to discern any difference. It was slightly disappointing to not have a bit of fanfare about entering Switzerland, but on the other hand I couldn’t help thinking that it would be nice if the border between the US and Canada were as straightforward. If they can do it among 14 nations in Europe, why can’t we do it with our friendly neighbor to the north? There was one painful reminder to us that we were in another country. Switzerland requires tourists to have a “vignette” (a window sticker) that shows we’ve paid the road tax for use of the highways. (In the USA this tax is built into fuel prices.) We stopped at a convenience store and bought one: it costs 40 Swiss francs, which is about $45. We’ll need it for three days. At one point we were considering stopping in Zurich, so we skipped the route that would have brought us around the city and ended up getting caught in a massive traffic jam. This cost us the better part of an hour, and all for nothing since we realized we’d rather continue on to Luzern instead. Luzern is a nice place, located on the shore of a lake and with nice views of the snow-covered Alps in the distance, but very expensive. Hotels in town start at CHF200 and rise rapidly from there (we splurged on a nice one so ours is more like CHF290, double what we’ll spend in Italy) and the restaurant prices are unbelievable. After a short walk around the downtown we hit a local grocery and made a smorgasbord for dinner and breakfast that cost CHF31. That’s what the hotel would have charged us just for one breakfast for one person. The prices here tell me that we’d be much better off traveling this region by Airstream, and I suspect that’s what we’ll do someday. Downtown Luzern seems to be mobbed with tourists, and more Americans than we’ve encountered anywhere else. Perhaps that explains the Burger King, McDonald’s, and Starbucks all on the same corner. At this point I am thinking we’ve done a little too much driving. Every day we are driving 4-5 hours, arriving in town around 5-7 p.m., and then spending the evening getting settled into the hotel and taking care of business (I still have to do some work while I’m “vacationing”). Dinner ends up being at 9 or even 10 p.m. and then we talk about what we are going to do the next day, and we don’t get to bed until 12:30 a.m. Today will be similar but to break the cycle we have booked two nights at Lake Maggiore (Italy) and will likely extend it to three days. We plan to use the Lake Maggiore hotel as a base camp for day excursions. Today’s plan is to make our final southward drive through the Gotthard Pass and down to Italy’s lake region. It should be the most spectacular drive of the entire trip, and shorter than the past few drives, so we’re looking forward to it. If you’re wondering about fuel cost, it’s about $8 per US gallon. We’ve put two tanks of gas in the car, which cost about 60 Euros each ($80). That’s expensive for a small car but really still not a bad deal, since we could spend nearly that much on breakfast here in Luzern. We can economize in other ways, which we do mostly by eating out only once a day. I see entries about stopping to see car museums and I am wondering if Eleanor isn’t looking for some culinary ones for you to enjoy! LOL!